Sunday night, 6:48 p.m. Starbucks. Open laptop. 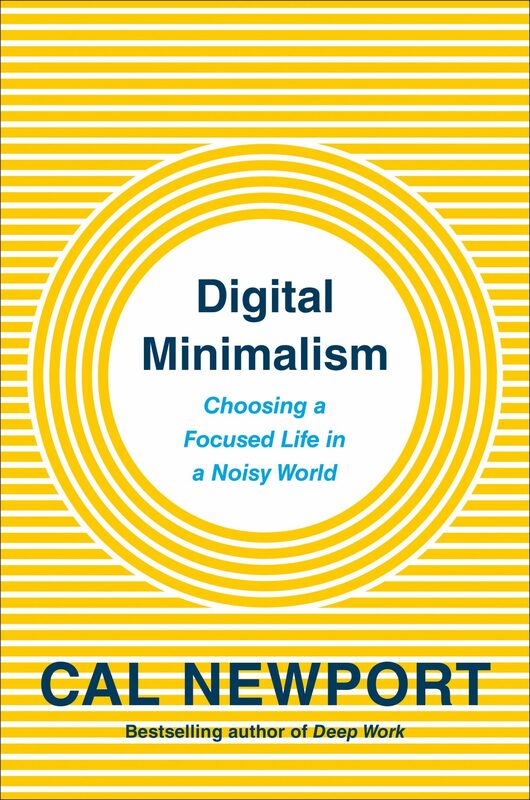 Get out copy of Cal Newport’s new book on digital minimalism to write review. Launch Microsoft Word. Stare at blank document for 10 seconds. Momentary blackout. Regain consciousness. Somehow the screen has transformed into Twitter. Twitter feed has been scrolled several hours down. Wait a second, how did I get here? Quickly close Twitter. Reopen blank Word document. Commence writing. Portfolio (2019). 304 pp. $26. In this timely book, professor Cal Newport shows us how to pair back digital distractions and live better with less technology. Introducing us to digital minimalists—the calm, happy people who can hold long conversations without furtive glances at their phones or obsessively document everything they eat—Newport reveals how to live more intentionally in our tech-saturated world. Cal Newport’s new book, Digital Minimalism: Choosing a Focused Life in a Noisy World, is a clearly argued, well-researched, and inescapably actionable case against our contemporary tech culture. Newport, associate professor of computer science at Georgetown University, urges his readers to repent of automatic appropriation of new tech, and instead take control of their intellectual, emotional, and social lives by relegating digital technology back to a tool, rather than a way of life. A red circle appears at the bottom of my laptop, a crimson dot with a centered, perfect white digit: 1. One new email! Quickly open mail. Read the first line: “How can we make your life better?” It’s an ad from the software company whose product I installed earlier today. Sigh. Resume writing. Chime! My laptop whistles, and then my phone dings as if in echo. A text from my wife. Lol at a pic of my son in the bath. I reply. She replies. How funny! Now where was I? Clutter is Newport’s term for technology (whether an app or phone or streaming service) that we adopt for the sake of minor or even hypothetical conveniences, rather than for the sake of better living out our most important values. Optimization and intentionality are how Newport describes having a value-driven conscientiousness to how we use technology. Rather than using Twitter and Netflix the way Silicon Valley tech companies hope we use them, Newport urges us to impose our values onto our tech, and to do so as part of a quest for the good (offline) life. Realize suddenly I haven’t updated my progress on the book on Goodreads. I make a mental note to do that tonight. Haven’t updated in a while and people are probably assuming I haven’t read anything lately. Newport’s philosophy of digital minimalism is an invitation to both radical action and also incremental transformation. He cites testimonials from people whose 30-day digital declutter (cutting “all optional technology” out of life, especially mobile tech) totally recalibrated their mental and emotional relationship with tech. The declutter is important because, as Newport explains, automatically defaulting to checking social media or streaming YouTube is a symptom of having lost track of the joys of offline life. “For this process to succeed,” he writes, “you must also spend this period trying to rediscover what’s important to you and what you enjoy outside the world of the always-on, shiny digital. . . . For many people, their compulsive phone use papers over a void created by a lack of a well-developed leisure life” (71). Digital minimalism’s potential to bring an ‘expulsive power’ to our daily habits is a seriously hopeful antidote to the anxiety and thinness of life that’s mediated by technology. That last point is important, because the digital minimalist lifestyle isn’t one primarily of abstaining—reintroducing technology is actually the final step in the digital declutter—but of adding offline experiences that our tech addictions tend to smother, like meaningful time alone (ch. 4), physical interpersonal relationships (ch. 5), and creative leisure (ch. 6) . . .
Phew, all this writing. Breathe for five seconds. Momentary blackout. Regain consciousness. How did these Google search results for “appendectomy” get here? Wait, didn’t the lady sitting across from me say something about it to her group? These WebMd symptoms sound familiar. Goodness, do I have a burst appendix? These commenters are pointing out . . .
It’s 7:30. Ugh. Okay, writing again. Digital Minimalism argues for lives that unfold in this moment, at this place, with these people. While digital technology is excellent at fostering low-grade “connection,” embodied relationships meet our human needs. Contrary to what tech companies say, balancing these two experiences is almost impossible, because time is a finite resource and must be applied either to “liking” a photo or swinging by for a visit, either refreshing the page or meditating silently. Digital minimalism has a place for the App Store, but it’s a place of strategic and intentional use, rather than of default recreation or supposed necessity. Digital Minimalism argues for lives that unfold in this moment, at this place, with these people. Some of Newport’s recommended practices land a bit heavy-handed. For example, his model of “conversation-centric communication” forbids texting anything beyond a brief update or question. The digital minimalist will “no longer participate in open-ended, ongoing text-based conversations throughout [the] day. The socializing that counts is real conversation, and text is no longer a sufficient alternative” (148). Newport unfortunately doesn’t explore how texting specific people might be a meaningfully different experience than scrolling through Instagram. On the other hand, the practices of digital minimalism do push us toward people and things we’re probably ignoring right in front of us. “If you adopt this philosophy,” Newport warns, “you’ll almost certainly reduce the number of people with whom you have an active relationship. . . . This sense of contraction, however, is illusory” (149). In other words, by removing the relational and recreational phantoms of digital life—hobbies we stick with only long enough to photograph, “friends” we barely know—our time and energies are diverted to people and activities that can offer genuine satisfaction. Mindlessly binging on a show bottoms out in frustration; fixing something around the house, or learning a new skill, reconnects us with our bodies. Newport is suggesting nothing other than a radical rejection of empty consumption—a call that any Christian should resonate with deeply. Digital minimalism’s potential to bring an “expulsive power” to our daily habits is a seriously hopeful antidote to the anxiety and thinness of life that’s mediated by technology. There’s a hipstery rock song playing six feet above my head. Catchy! I should look it up. Front page of YouTube has a recommended clip for me from Prime Minister’s Questions. How did I miss this one? Now 8:10 p.m. Where has the time gone? Back to writing. Newport’s lack of theological reflection means his appeal to “values” is less a moral teleology and more of an expressive individualism-friendly nostalgia for the pre-Facebook era. Some Christians may be tempted to take this fact and dismiss Digital Minimalism as a well-meaning but mostly irrelevant secular jeremiad. But this would be a mistake. How we use our technology is a theological question, because Jesus Christ claims lordship over all areas of life. How we use our technology is a theological question, because Jesus Christ claims lordship over all areas of life and commands both supreme loyalty to himself and also a life spent in love for others. To the extent that our technological habits dislocate and distract us, they make us less human, and thus less able—and maybe even less willing—to live as who we are: special image-bearers of the Creator. Believers should follow Newport’s counsel and reject a trade-off between convenience and loss of joy, or between momentary entertainment and the loss of being prayerfully present in the quiet and mundane stretches of life. Oh, I should tweet that. I honestly can’t believe he retweeted that ridiculous opinion. Is he even a real Christian? I should blog about it. Chime. Better check this text. in a distracted, dislocated, and dissatisfied time. “Save.” Man, that was productive. Wonder what’s on Netflix? Samuel D. James is an associate acquisitions editor at Crossway Books and editor of Letter & Liturgy.